It is very encouraging to see the topic of level boarding on the mainline railways start receiving the attention it deserves. Allowing wheelchair users and other people who have reduced mobility to use rail transport independently, without the need for booking in advance or relying on staff members to deploy ramps, is crucial to ensuring that these passengers can travel with confidence and dignity. Level boarding refers to the case where the step and gap between the platform and the train doors are minimised to allow wheelchairs and other mobility aids to be safely rolled onto the trains. According to UK standards, the upper limits of level boarding are a 50 mm step and a 75 mm gap. Allowing wheelchair users and other people who have reduced mobility to use rail transport independently is crucial to ensuring that these passengers can travel with confidence and dignity. As the DLR, Jubilee Line extension and upcoming core Elizabeth Line section show, level boarding is now a requirement for brand new transport infrastructure from the design stage, and relies on features such as straight platforms, accessible trains with dedicated wheelchair spaces, standard rolling stock design, and matching platform and train floor heights that allow passengers to board from any part of the train. For existing systems built without this level of accessibility in mind, many issues stand in the way of level boarding, including gaps due to curved platforms, trains that are consistently a step up from the platforms, a mix of rolling stock with different dimensions, and mainline platforms that are themselves non-standard in height. One solution that has found success in the London Underground is the use of platform humps to achieve level boarding on part of the train. Given the Victoria line’s uniform and modern rolling stock, physical segregation from other services, and straight platforms, platform humps were able to solve the line's level boarding problems. However, this just doesn’t work for the mainline railways. Due to the mixing of local, long-distance, and freight trains along the same corridors, all with different heights and sizes, it is not feasible to just raise platforms or add platform humps as this would either mean setting the platform further away from the train or restricting the type of trains that can go through a station. This also does not address the significant gaps created at curved platforms. One very promising option involves lowering all or part of the floor height of the train. Doing so would create areas on the train where the train floor and platform (provided it is the standard height) are matching. This is exactly what new rolling stock from Stadler Rail will do on some services on Greater Anglia, Wales & Borders, and Merseyrail, along with automatic gap fillers that will reduce any excessive horizontal gap. Unfortunately, the majority of recently-built and upcoming rolling stock will have the normal high train floors, making it impossible to achieve level boarding on most portions of the railway. ...it is not feasible to just raise platforms or add platform humps for mainline railways. The few exceptions, at Heathrow and the core sections of Thameslink, Elizabeth Line, and the East London Line, have segregated traffic and were able to support raised platforms. While this seems like a step forward compared to the previous situation, it is now impossible to have level boarding along the length of any of those lines, as a train will have to cater to two separate platform heights and make sure they are both accessible internally. All in all, continuing with high floor trains, unless all future trains are standardised, is a major barrier to level boarding. Even if novel solutions, such as using a set-back platform hump combined with a retractable gap filler, were used for these trains, there may be issues such as trip hazards and reduced platform width. Clearly it is wholly unreasonable to trash thousands of new trains. Another option may be to lower the floor of a single coach, which is what has been done in Barcelona. As a normal high floor train goes in for maintenance, one of the coaches is refurbished and its floor is lowered to reach the standard platform height. This way, the station infrastructure remains the same as does not restrict freight traffic, but still allows for level boarding without a massive order of new trains. While this is the most feasible, consistent solution across the board, it would require significant adjustments to brand-new infrastructure, such as the Elizabeth Line where core platforms (and platform-edge doors) would have to be lowered to 915 mm. There are clearly options available to address level boarding. There just needs to be the will to implement them. 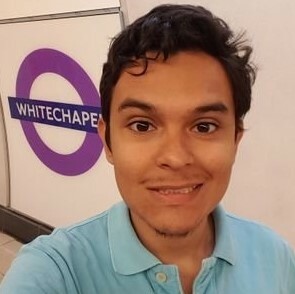 Tomas Rey is the creator of stepfreelondon.uk, a site dedicated to documenting the status and development of step-free access across all of London’s rail systems. Accessibility is a very important matter to Tomas, as his partner is a wheelchair user and they often travel to London. The purpose of his website is to inform readers about the ongoing expansion of step-free access while also being a useful resource for those wishing to travel in and around the capital.